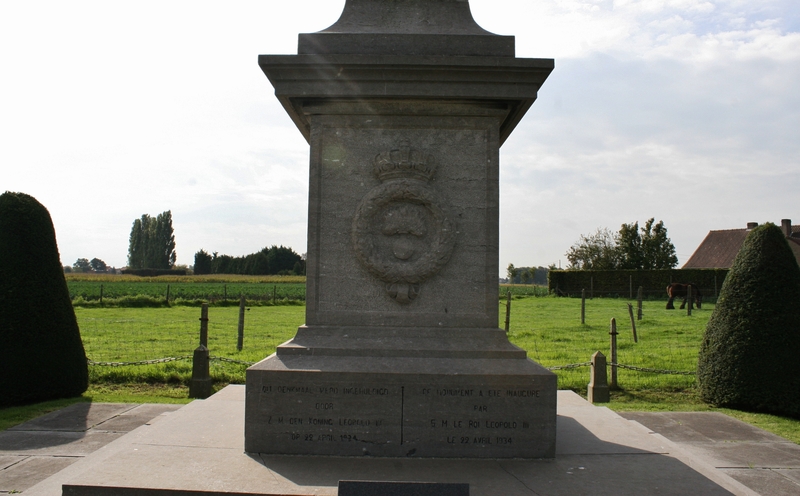 Hot on the heels of our brief stop in Lizerne, here we are a little under half a mile north of the village, and this is the memorial to the Belgian Grenadiers who died during the first German gas attacks at the start of the Second Battle of Ypres. 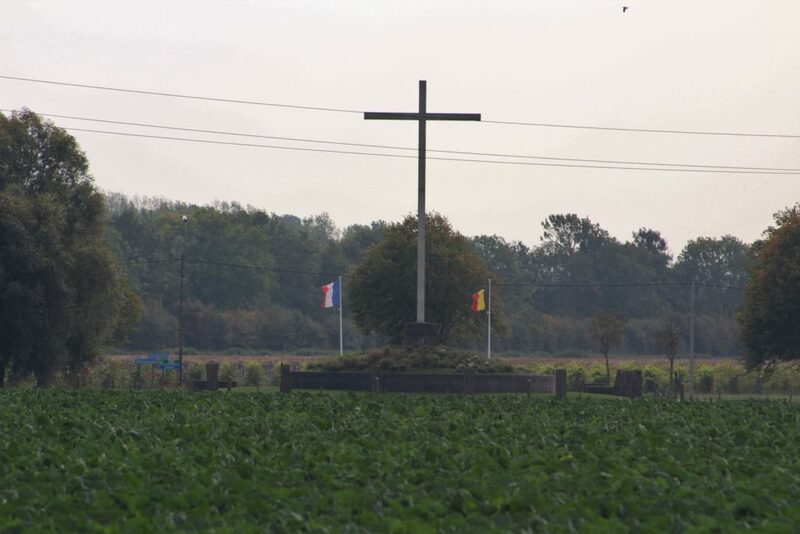 Following the first release of gas by the Germans on the afternoon of 22nd April 1915, and to cut a very long story short (the actions described here relate only to the attacks against the French & Belgians – to their right the Canadians were fighting their own desperate battle to plug huge gaps in the line amidst the clouds of chlorine, but their story, vital to the battle as it was, does not concern us here), by later that evening German infantry had pushed on to the Yser Canal at Boesinghe. The gas had, by this time, mostly dispersed, French troops had barricaded both Boesinghe bridges as we saw a few posts back, and a defensive force made up of Zouaves, French gunners and territorials forced the Germans to dig in on the eastern bank. 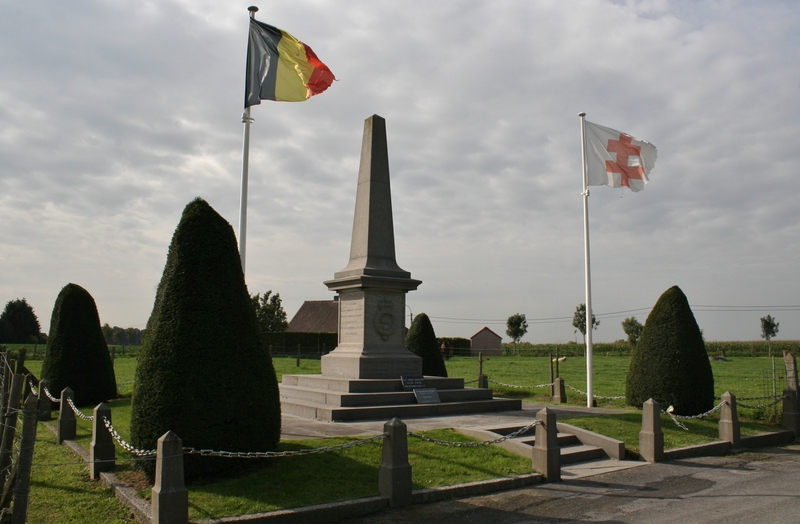 Belgian troops put up a fierce resistance all along the canal, holding the Germans until late evening, when the Germans succeed in crossing the canal at both Steenstraat and the Het Sas lock just south of Lizerne, setting up bridgeheads on the western side. 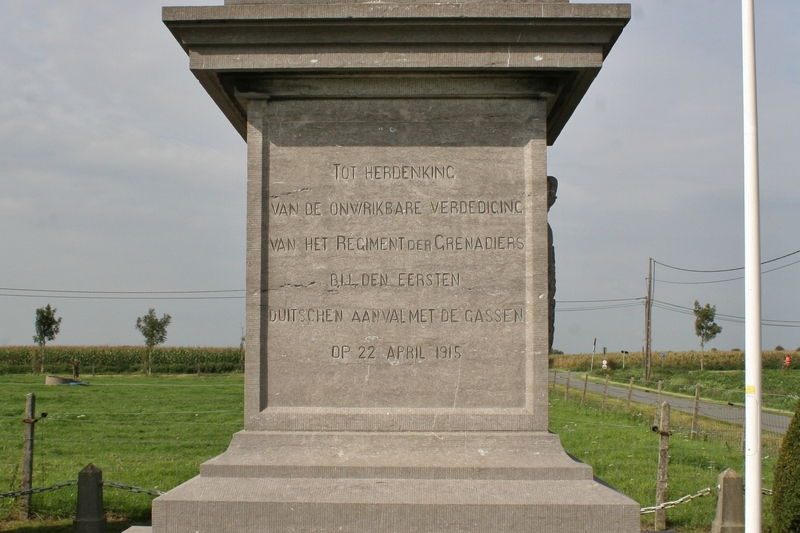 It was the Belgian Grenadiers and the 2nd Carabiniers, whose plaque we saw last post, who held the line at Steenstraat, preventing the Germans from pushing any further west. 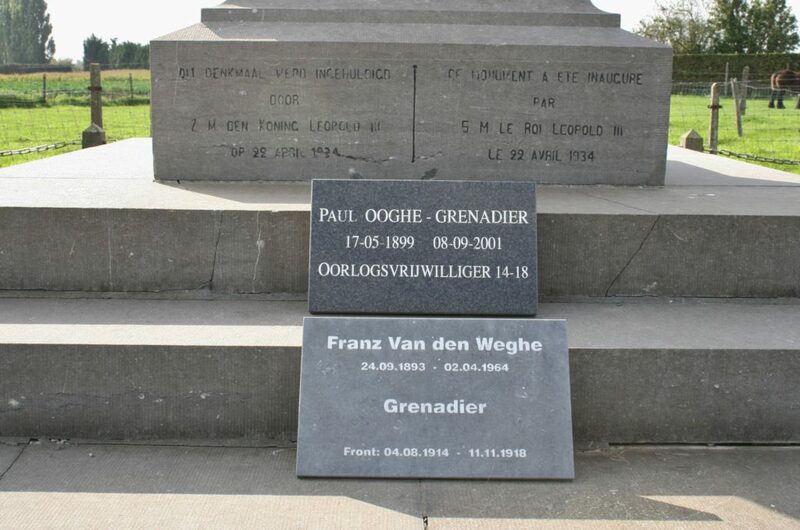 These tablets at the base of the memorial remember two survivors, both men in uniform from first to last, Grenadier Paul Ooghe being, when he died in 2001 at the ripe old age of 102, the last Belgian Great War veteran. Above & below: Flemish inscription on the eastern face. 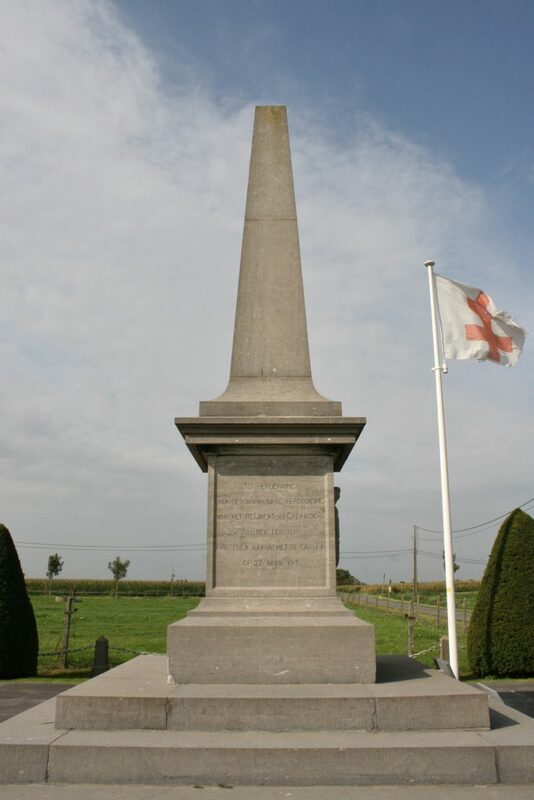 Later in the evening of 22nd April more gas was released and the Germans once more attacked the Belgian and French troops defending the canal, but in the teeth of terrific resistance, on this occasion not a single German raft entered the water as the German attack failed completely. 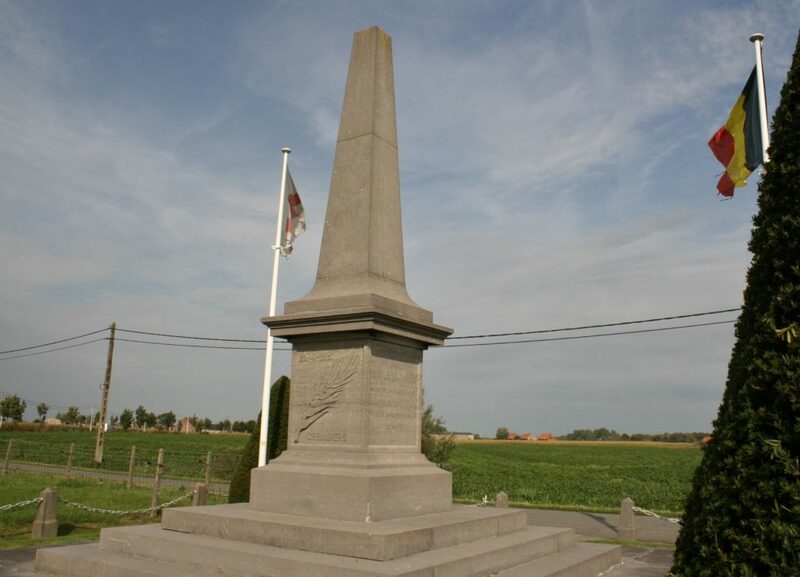 Nonetheless, the day had seen the Germans drive a five-mile wedge into the Allied lines, advance two miles in double-quick time, create two bridgeheads on the canal’s western bank, and the situation, for the Allies, was still desperate. Above & below: Reverse panel. The ‘Regiment Grenadiers’ was created by King Leopold I in 1837 , soon recognised as an elite regiment by their simple expedient of nicking elite companies from other regiments. You might be interested to know that the ‘Regiment der Carabiniers’, named as such in 1850 because by that time the men were equipped with carbines as opposed to rifles*, would eventually amalgamate with the grenadiers in the 1990s, and although reduced to a battalion in the 21st Century, could most recently have been found fighting in the hills of Afghanistan. *the basic difference between the two being that the carbine is lighter, easier to handle (because it was originally designed, during the Napoleonic Wars, to be used on horseback) and has a shorter barrel than a rifle. Above & below: Western panel. 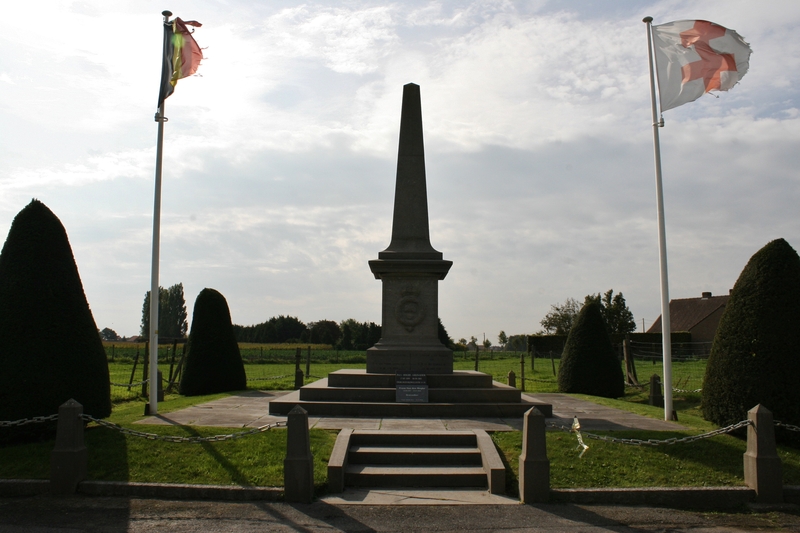 Throughout 23rd April, two German divisions assaulted the French & Belgians defending the canal, one at Lizerne and the other at Boesinghe. 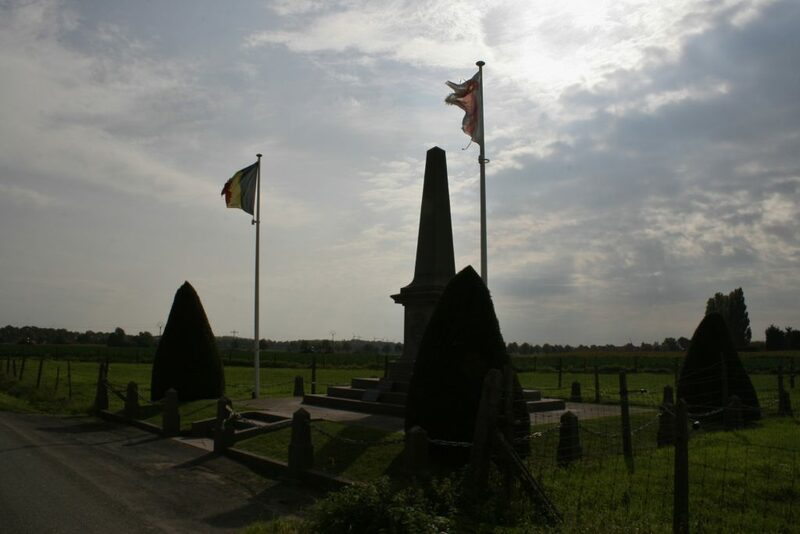 Once more gas was used, although Belgian reports maintained that its use was on this occasion poorly organised and had little or no effect. 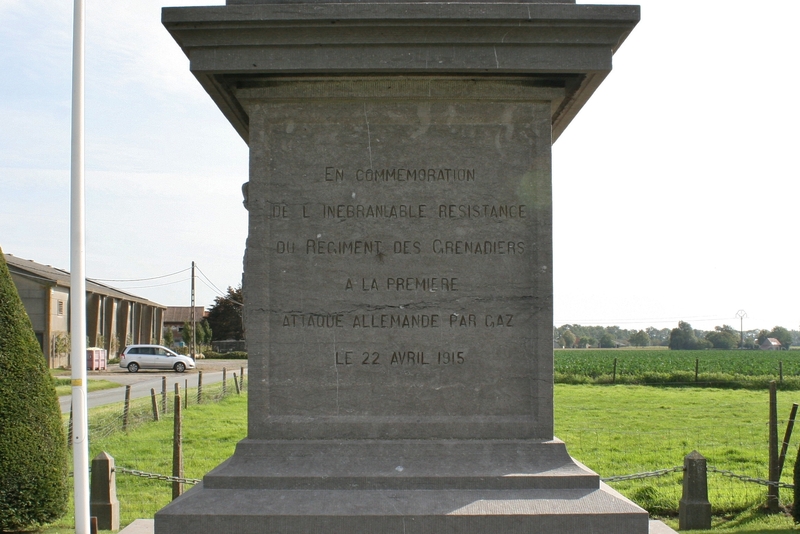 Nonetheless the Germans managed to take Lizerne and although the shattered village was briefly recaptured by Grenadiers & Carabiniers of 6th Division, it was in German hands once more by midnight. 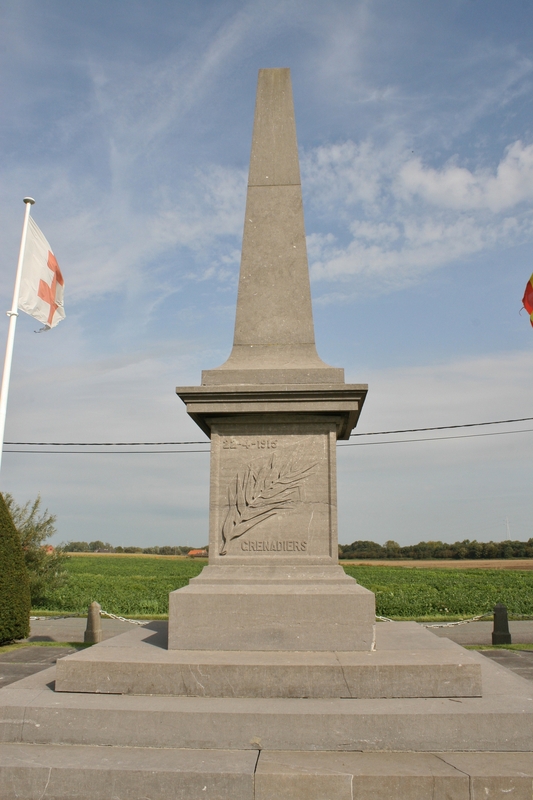 French and Belgian reinforcements were immediately rushed to the sector and prevent any further German advance. 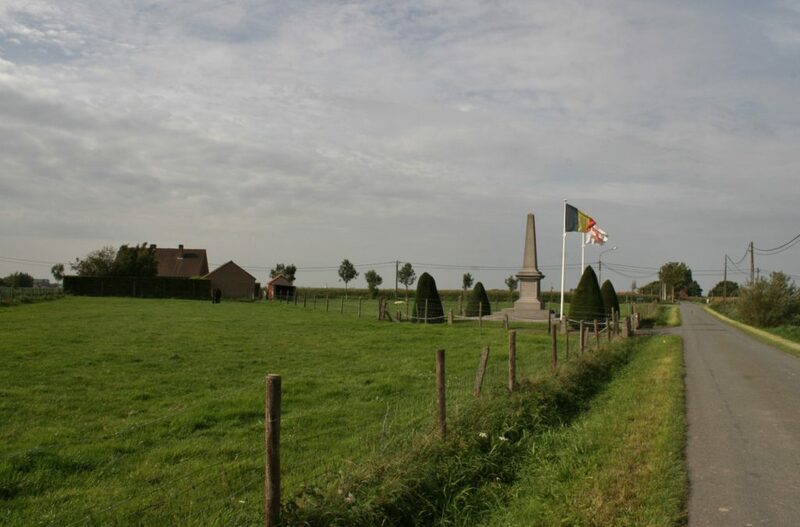 On 24th April the Germans released more gas on the Belgians along the canal (one wonders how this affected the morale of the Germans in the two bridgeheads on the western side of the canal, who presumably had to endure their own gas rolling across their positions to reach the Belgian lines*), followed by repeated infantry attacks, but the Belgians managed to beat off all attempts to break their lines. *Within an hour of the first release of gas on 22nd April, the Germans had taken the Pilckem Ridge, where they proceeded to dig in. History has always pointed to one of the main reasons for the ultimate failure of the Germans to achieve a decisive breakthrough following the gas attacks being their lack of reserves to exploit the ensuing chaos; they simply had no idea how effective the gas would be. 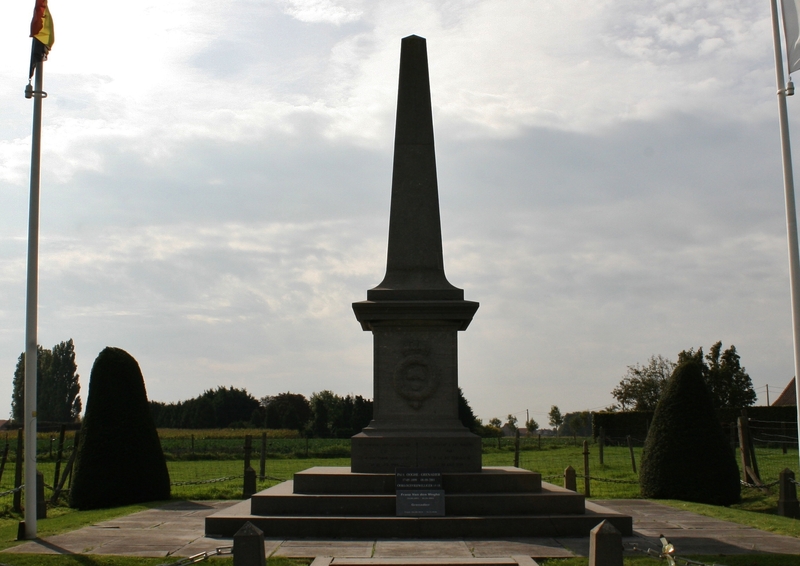 True as this may be, Sir Basil Liddell Hart was among the first to suggest that perhaps fear of their own gas (imagine the terror that must have struck the first German troops to encounter dead or dying Zouaves) was the overriding reason that the Germans dug in on the ridge, rather than rushing on into their own gas clouds. Now reinforced, on 27th April Belgian and Zouave infantry recaptured Lizerne and pushed the Germans back to Het Sas, capturing six guns on the way. 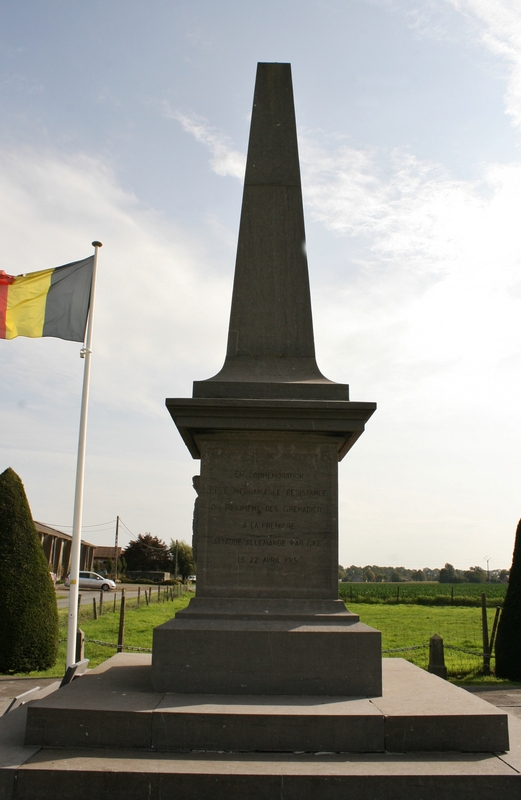 The main thrust of the German attacks had begun to move south, as the battle to prevent Ypres itself falling into their hands continued, and on 15th May, after a fierce Belgian bombardment, Zouaves and Algerian sharpshooters captured Steentraat and reached the banks of the canal. Some six hundred German dead surrounded the village. All attempts by the Germans to counterattack failed, and within two days there were no Germans, barring the dead and the captured, on the west bank of the canal. 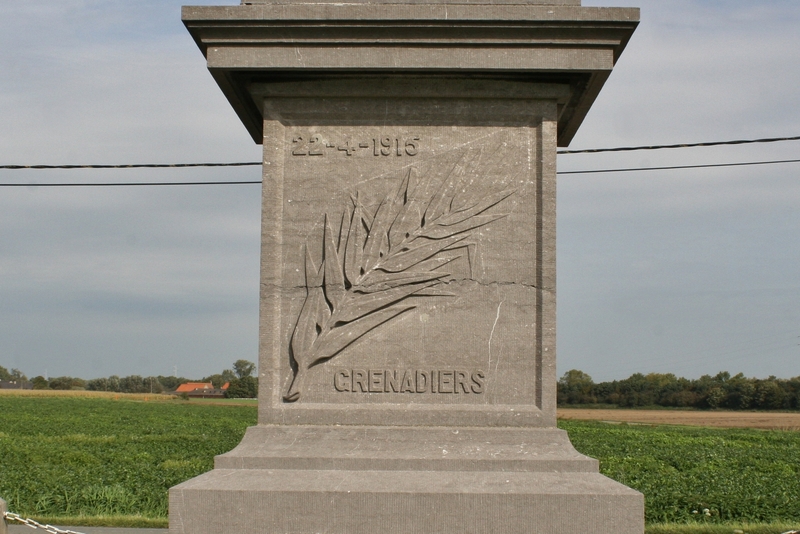 In two days of fighting the Belgian Grenadiers lost ten officers and 433 men, but they held the line, fighting off all German attempts to break through, despite having little or very rudimentary defenses against the new terror weapon. 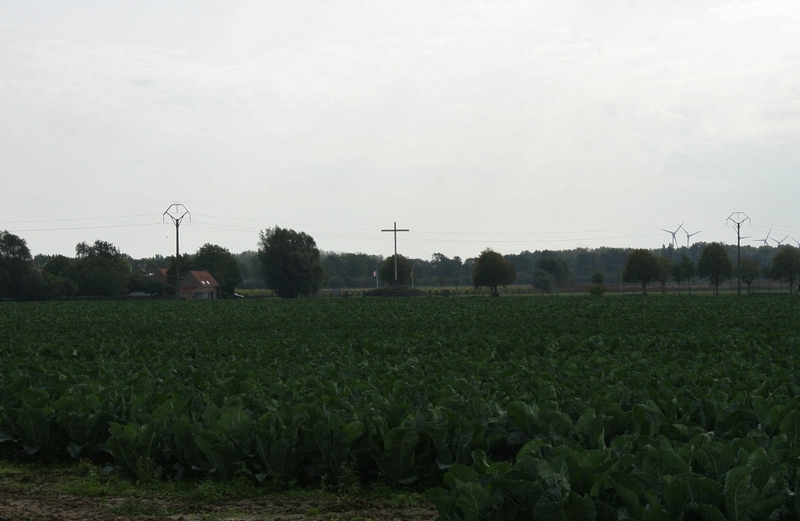 …already visible across the fields – click here for Part Eleven. 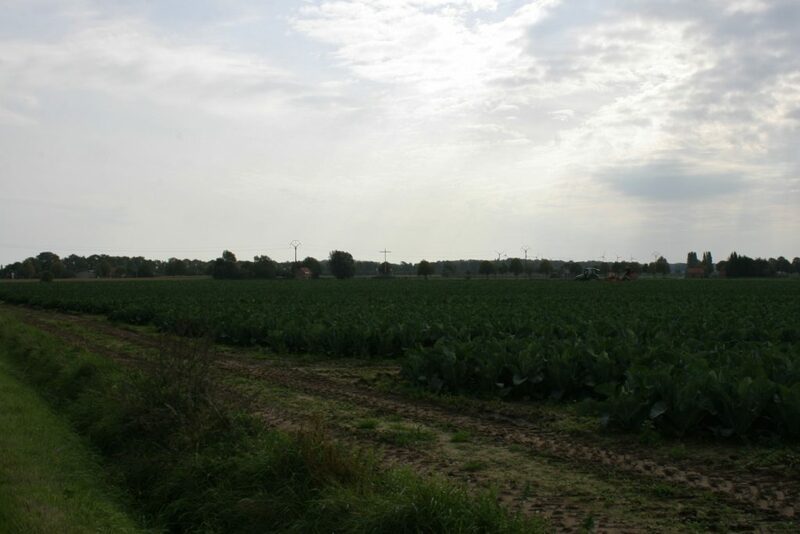 This entry was posted in Boesinghe, Lizerne. Bookmark the permalink.